Symthic Forum was shut down on January 11th, 2019. You're viewing an archive of this page from 2019-01-09 at 00:54. Thank you all for your support! Please get in touch via the Curse help desk if you need any support using this archive. I like the clear visual delineation at rank 50. That makes it easy to size up how well teams are balanced. But ok, a simpler visualization of level in comparison to bf3...i approve of this. Only 100 ranks this time or do we think it'll begin adding numbers beneath Rank 100's emblem like it does in BF3? I approve of the lack of 1-45 then 1-100. That was retarded. Awww, no more gold eagle. 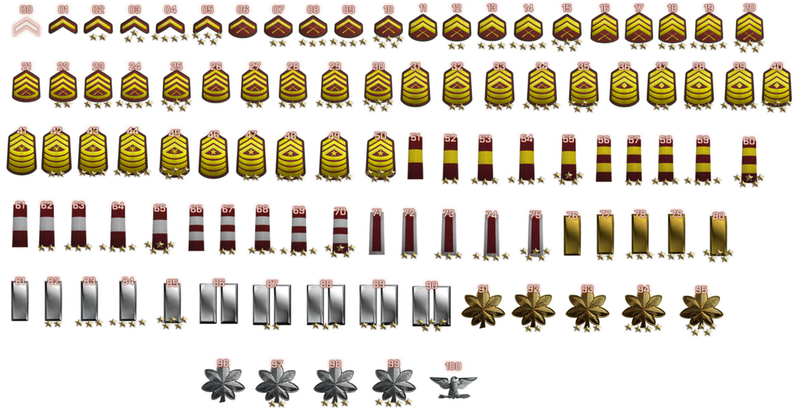 However, this makes it simpler to tell ranks. Acceptable trade off. The Colonel eagle is very different from that officially posted by Dice on the "road to bf4 rewards " blog. If you look at that blog, you'll see that the golden eagle both, looks the other way, and is golden. Also dice speeks of "Ultimate goal: Reach Colonel 100." Unless there is more of a source than a random image posed on imgur, I call fake. Nope, this is it, just 100 ranks total. I am part of that power which would the evil ever do and ever does the good. Are you a Symthican and a PC BF3 player? Help represent Symthic on the battlefield.